Citizen Resources - Southern Platte Fire Protection Dist. Endorsed by Hospitals, EMT’s, COAs, TRIAD’s, Municipal, Medical, Senior Citizen Organization, Police, Sheriff’s, and Fire Departments. in place in approximately 4,500 communities. in place in over 14,000,000 homes. throughout the United States, and growing every day. Medical Emergencies can happen to anyone at any time. That’s why everyone needs the “File of Life”®. We need your help to start saving lives in your community. With the “File of Life”® there is solid information on conditions and medications. It’s written down and ready to be utilized immediately by EMT’s & Paramedics. The FILE OF LIFE FOUNDATION, INC. is a non-profit corporation promoting life-saving ideas. The products we provide involve a medical information packet designed to provide emergency personnel with the necessary medical data to begin immediate treatment. “File of Life”® is a personal medical home file that is prepared and available for emergency first responders. Fill out the medical card, making sure all information is accurate and legible. Use a pencil when filling out the card to allow for future updates. When complete, place the file on the outside face of your refrigerator. Keep all medical data up to date. Update your information whenever medical history or medications change. 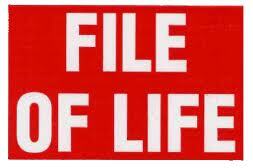 Place the “File of Life”® sticker on your front door.